As we count down for the start of college basketball season, we set out to put together a thorough guide for the sport's non-conference season. The non-conference portion of college basketball teams' schedules feature intriguing tournament brackets played in exotic locations and major U.S. cities, inter-conference showdowns with conference superiority at stake, and home-and-home series that take place in raucous on-campus environments. These games can determine whether or not your team will make the NCAA tournament and what seed it gets if it does make the 68-team field. This list, of course, does not include every non-conference tournament, game or Division I school, but if you're looking to find out what important early season games you need to watch, this is a pretty good place to start. Here's your A-to-Z guide for college basketball's non-conference season. Location: ESPN Wide World of Sports, Lake Buena Vista, Fla. Defending national champion Villanova headlines the eight-team AdvoCare Invitational, with Canisius, College of Charleston, Florida State, LSU, Memphis, Oklahoma State and UAB rounding out the field. The championship game is scheduled for Sunday, November 25 at ESPN Wide World of Sports in Lake Buena Vista, Florida. Six power conferences will be represented on Paradise Island, Bahamas, for the 2018 Battle 4 Atlantis. Villanova won the Battle 4 Atlantis last fall before cutting down the nets in April, so don't underestimate the value of early season tournaments. Butler, Dayton, Florida, Middle Tennessee State, Oklahoma, Stanford, Virginia and Wisconsin will compete in paradise in the three-day tournament. Location: TD Arena, Charleston, S.C. The Charleston Classic's field could be classified as sneaky good. Purdue is led by All-American candidate Carsen Edwards, Buzz Williams has taken Virginia Tech to the NCAA tournament in each of the last two seasons after a nine-year drought, Alabama returns three of its top four scorers from a 20-win team, and Wichita State has made the last seven NCAA tournaments. But the Charleston Classic's depth extends beyond the power conference teams. Davidson, fresh off of a 21-win season that included an A-10 Tournament title and NCAA tournament bid, will be led by sophomore guard Kellan Grady, who is poised to blow up as a sophomore after averaging 18 points per game as a freshman. Ball State has won 61 games in the last three seasons and Northeastern won a share of the Colonial Athletic Association's regular season title in the spring. Spending the holidays in Hawaii watching college basketball – where do you sign up? Bucknell, Charlotte, Colorado, Hawaii, Indiana State, Rhode Island, TCU and UNLV are the eight teams in this geographically diverse field. The Bison, Rams and Horned Frogs were the three teams in the tournament that made the NCAA tournament last season and all three are in the same half of the Diamond Head Classic bracket. Rhode Island and TCU graduated their leading scorers – and UConn hired former URI head coach Dan Hurley in one of this offseason's impactful coaching hires – so this tournament could be wide open. Last year, TCU won the Emerald Coast Classic as part of its 12-game winning streak to start the season as the Horned Frogs earned their highest ranking in program history at No. 10 in the AP poll. This year another Big 12 team, Baylor, will look to build similar momentum at this November tournament. The Bears, along with Cincinnati, George Mason and Ole Miss, will headline the field. Cincinnati went 31-5 and earned a No. 2 seed last season, George Mason returns 12 letter-winners from its 2017-18 team that earned the program's best finish ever in the A-10, and Ole Miss, which won the Emerald Coast Classic (over Cincinnati, ironically) in 2014, enters a new era under head coach Kermit Davis. In what has become one of college basketball's premier season kick-off events for the last seven years, the State Farm Champions Classic will once again bring together four of the best college basketball programs in the country for a neutral-court doubleheader showcase. This year Bankers Life Fieldhouse in Indianapolis will host the event, which bounces also around from New York to Chicago to Atlanta on an annual basis. Duke plays Kentucky and Michigan State squares off against Kansas. This night will serve as the national introduction for Duke's talented, five-man freshman class featuring R.J. Barrett, Cam Reddish, Zion Williamson and Tre Jones, and Kentucky's highly regarded newcomers EJ Montgomery, Ashton Hagans, Keldon Johnson, Immanuel Quickley and Tyler Herro. Kansas and Michigan State will feature more veteran players, as Memphis transfers Dedric and K.J. Lawson will be eligible for the Jayhawks, and the Spartans' core will be comprised of juniors Cassius Winston, Joshua Langford and Nick Ward. All four teams could be ranked in the top 10 in the preseason and don't be surprised if Duke, Kansas and Kentucky are ranked No. 1, No. 2 and No. 3 in some order. This is the fourth iteration of the Gavitt Tipoff Games, a.k.a. the four-day Big East-Big Ten challenge, and it includes a rematch of last season's national championship game, with Michigan traveling to Villanova on Nov. 14. Other matchups include Xavier hosting Wisconsin in a rematch from last year's Gavitt Games, Marquette visiting Indiana, Nebraska hosting Seton Hall, a regional matchup between Rutgers and St. John's in Piscataway, New Jersey, Georgetown-Illinois, Penn State-DePaul and Ohio State-Creighton. Nebraska, Missouri State, Texas Tech and USC will headline the championship rounds of the Hall of Fame Classic this fall. Nebraska and Missouri State fans should pack the house and even Texas Tech, which made the Elite Eight last season, is only a three-and-a-half-hour plane flight from Kansas City. Announcing the field for the 2018 #HOFClassic! Chris Beard, who's entering his third season with the Red Raiders, led the school to a remarkable step forward in year two, taking Texas Tech from 18 to 27 wins and this will be a chance for his team to establish itself on a national stage early in the season. Nebraska, meanwhile, missed the NCAA tournament last season despite winning 22 games, so the Hall of Fame Classic will provide a critical opportunity for the Huskers to pick up key non-conference victories. The eight-team field for the Bahamas Showcase includes FAU, Georgia Southern, Incarnate Word, Miami (OH), Montana, North Dakota State, Pepperdine and Towson. Montana was the best of the bunch last season, finishing the year ranked No. 72 on kenpom.com after posting a 26-8 record and 16-2 mark in the Big Sky. The Jamaica Classic will feature six teams this fall, most notably Kingston, Jamaica, native Patrick Ewing taking his Georgetown team to his birth country for this November tournament. Austin Peay, Campbell, Loyola Marymount, Ohio and South Florida round out the field. Austin Peay had the best record last season among participating teams at 19-15 out of the Ohio Valley Conference. For the third time in four years, the SEC/Big 12 Challenge – the rare January non-conference event – features a Kansas-Kentucky matchup. The Jayhawks have been victorious in six of their nine meetings with the Wildcats in the Bill Self era. Kansas beat Kentucky in the Champions Classic last year 65-61, the Jayhawks won at Rupp Arena in the 2017 SEC/Big 12 Challenge and at home in overtime over Kentucky in 2016. Location: Barclays Center, Brooklyn, N.Y.
College basketball in the greater New York City area is better when St. John's is good and the Johnnies showed flashes of greatness last season, beating No. 4 Duke and No. 1 Villanova in the span of five days and finishing with 16 wins on the season – the most under former St. John's star Chris Mullin. St. John's will have the shortest commute to the four-team Legends Classic, which also features Temple, VCU and Cal. It's the Johnnies versus the Bears and Temple versus VCU in the first round. All four programs are in different stages of rebuilding, with Cal coach Wyking Jones and VCU coach Mike Rhoades both entering their second year at their respective schools. If St. John's can win the Legends Classic, that would be an encouraging sign as the Red Storm tries to make it back to the NCAA tournament for the first time since 2015. Keep an eye out for junior guard Shamorie Ponds, who averaged 21.6 points, 5.0 rebounds and 4.7 assists per game last season. The Maui Invitational, arguably the premier college basketball non-conference tournament, will feature eight Division I teams for the first time in the event's history, making it the strongest field ever, according to the tournament's website. The schools competing are Arizona, Auburn, Duke, Gonzaga, Illinois, Iowa State, San Diego State and Xavier. If you're counting at home, that's four teams that won their regular season conference title last season and five teams that were a top-four seed in the 2018 NCAA tournament. While featuring a smaller field than many early season tournaments, the NIT Season Tip-Off is loaded. Kansas has a shot to enter the season as the No. 1 team in the country, defending SEC co-champion Tennessee returns SEC Player of the Year Grant Williams and its top five scorers, a Marquette team that had a top-15 offense and the third-best 3-point shooting team in the country last season, and Louisville with new head coach Chris Mack. Final Four participant @KUHoops will headline a stacked early-season tournament in NYC this Thanksgiving week! Secure first access to the best seats by signing up for our pre-sale - last day is today! Who doesn't love a good non-conference matchup, especially when it's between regional opponents? Oklahoma and Wichita State will meet at Chesapeake Energy Arena in early December. Despite being located less than 200 miles apart, the Sooners and Shockers have only met four times on the hardwood but this will be the third meeting in as many years. Oklahoma won at Wichita State last season, after the Shockers won in Oklahoma City 76-73 the year before. The 2018 Paradise Jam features a strong mix of power conference and mid-major schools. 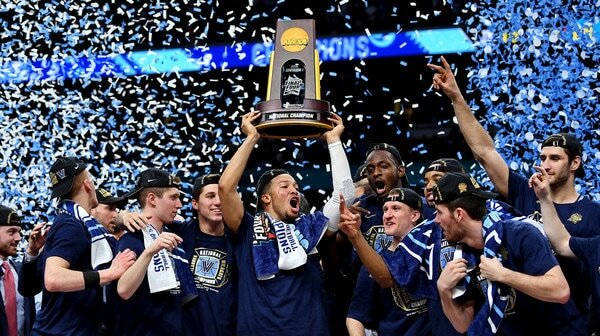 Old Dominion will make its fourth appearance in the tournament – the most of any school competing this year – and the Monarchs have a 2010 Paradise Jam title in their trophy case. Kansas State, which makes its second appearance in the tournament, is probably the team to beat after the Wildcats return their top seven scorers from a team that made the Elite Eight last season. Eastern Kentucky, Kennesaw State, Missouri, Northern Iowa, Oregon State and Penn will round out the field. There aren't many options for college basketball non-conference tournaments or events that start with the letter "Q," so we're going with a game that will mean a lot to the basketball-famous Dunleavy family. Quinnipiac head coach Baker Dunleavy, the son of former NBA player/coach and current Tulane coach Mike Dunleavy Sr, will take his Bobcats squad to Villanova, his alma mater, for a non-conference game in mid-November, as reported by Fan Rag Sports. There are a handful of smaller, round-robin tournaments this fall, such as the Gotham Classic (Duquesne, Notre Dame, Radford, UIC and William & Mary), the Men Against Breast Cancer Cup (Alabama A&M, BYU, Houston, Northwestern State and Rice), and the John Bach Classic (Columbia, FIU, Fordham and Youngstown State), which allows schools to schedule and play multiple non-conference games in conjunction of each other over the course of a week or two. Sure, this is a little redundant after we previously mentioned the Kansas-Kentucky matchup in next season's SEC/Big 12 Challenge, but given that the Jayhawks and Wildcats could be the two best teams in the country next season, that game warranted its own section. However, there are still plenty of other intriguing matchups between the two conferences: West Virginia at Tennessee, Florida at TCU, Alabama at Baylor, Texas at Georgia, and Kansas State at Texas A&M, to name a few. In the midst of conference play across the country, this is a nice break to see matchups you normally wouldn't in late January. Give credit to Oklahoma for scheduling games at regional sites. The Sooners will play USC at Tulsa's BOK Center – one of nine road or neutral-site games on their schedule next season. The CBS Sports Classic is another one of college basketball's premier four-team non-conference events. Featuring rotational matchups between Kentucky, North Carolina, Ohio State and UCLA, this fall's CBS Sports Classic is set for matchups of OSU-UCLA and Kentucky-North Carolina. The four schools have combined for 26 national championships, 64 Final Four appearances and 98 wins last season. Despite the changing matchups, host cities and rosters, the CBS Sports Classic always guarantees compelling basketball, given the history and stature of the four programs, and this year should be no different. Minnesota, Santa Clara, Texas A&M and Washington will compete in the Whistler Bracket at the inaugural Vancouver Showcase in November. The Aggies are coming off of the best 2017-18 season of the four teams – going 22-13 with a Sweet 16 appearance after upsetting No. 2 seed North Carolina. Marquette basketball will have a new home this year as the Golden Eagles move from the BMO Harris Bradley Center to the Wisconsin Sports and Entertainment Center. Their first game at the new arena is Nov. 6 against UMBC. Do the Retreivers have any magic left from their upset of No. 1 seed Virginia to spoil the Golden Eagles' grand opening? Marquette will also host Kansas State (Dec. 1) and Wisconsin (Dec. 8) as part of its non-conference schedule. Marquette coach Steve Wojokowski told NCAA.com the arena will be the best in the country, which would be a massive homecourt advantage for the Golden Eagles. The Cincinnati-Xavier rivalry may not resonate nationally in the way that Duke-North Carolina or Kentucky-Louisville does, but for those who live in Cincinnati, it's as important as any single game that will take place in the city in the calendar year. The Bearcats lead the all-time series 50-35 but the Musketeers have won eight of the last 11 matchups. Cincinnati will have a newly remodeled Fifth Third Arena, Xavier will have a new head coach on the sidelines in Travis Steele. Both teams are coming off of a season in which they earned top-two seeds in the NCAA tournament, so this should be a high-quality matchup, even for fans without a rooting interest. California will take part in the fourth iteration of the Pac-12 China Game. There are few geographical boundaries when scheduling college basketball non-conference matchups – we've seen games outdoors on aircraft carriers, so what is a flight to China? – and Cal will make the jump across the ocean for the game on the opening night of the college basketball season. Yale actually ranked 47 spots higher in kenpom.com's efficiency ratings last year so don't write off the Bulldogs. Gonzaga's non-conference schedule includes games against North Carolina, Tennessee and Texas A&M, in addition to a trip to the Maui Invitational, which means the Bulldogs will have plenty of opportunities to pick up resume-building wins before the start of WCC play. Gonzaga made it to the national championship in 2017, won 32 games and made it to the Sweet 16 in 2018, and with the return of four of its top five scorers, the 'Zags are poised to put together another strong team next season. The difficulty of their non-conference schedule is a tremendous opportunity from both an experience and potential seeding perspective. Gonzaga has earned a top-10 ranking during five of the last six seasons and winning the games listed above could take the Bulldogs to the top of the polls again, but given the expectations they'll have heading into next season, there may not be much room to climb.